I went to Starbucks the other day looking for a snack of some kind and I saw a rice crispy treat that was label gluten free. I got really excited! And then, I saw that it had butter in it. Bummer! That small glimpse of a rice crispy treat craving off. I started to research how to make it both gluten and dairy free. I remember my mom making rice crispy treats with margarine so I knew that was possible. I wasn’t sure if Rice Krispies, the actual cereal, were gluten free, but after a quick check online it became clear they were not. Then there were the marshmallows. Many are gluten free, but not many are also vegan. I wanted to go all vegan since I have quite a few friends who are vegetarian and wanted them to be able to try them too. So, I headed out to the good ol’ PCC and low and behold they had vegan gluten free marshmallows in regular and pumpkin flavor! Ka-zaa! So I bought them and decided to cross my fingers that it would work. 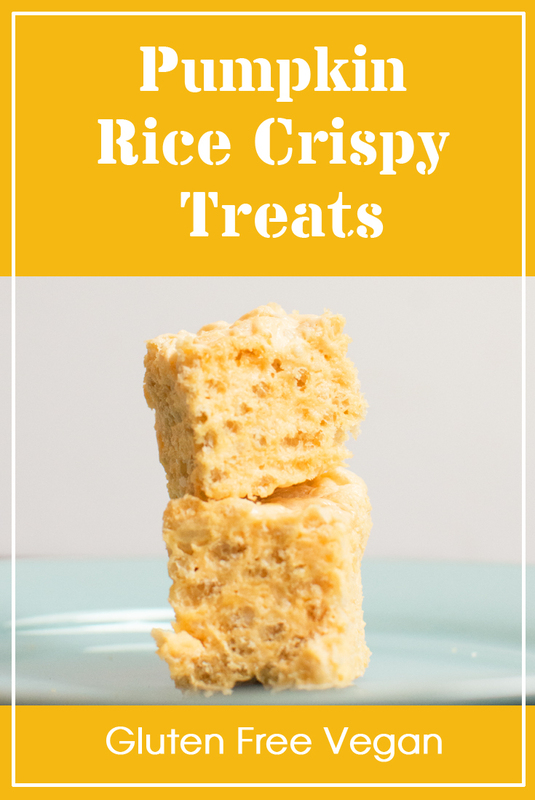 I used a regular rice crispy treat recipe for the proportions, but subbed my ingredients and made a much smaller batch. The gluten free vegan marshmallows are not cheap at over $5 a bag! It was super quick and easy. 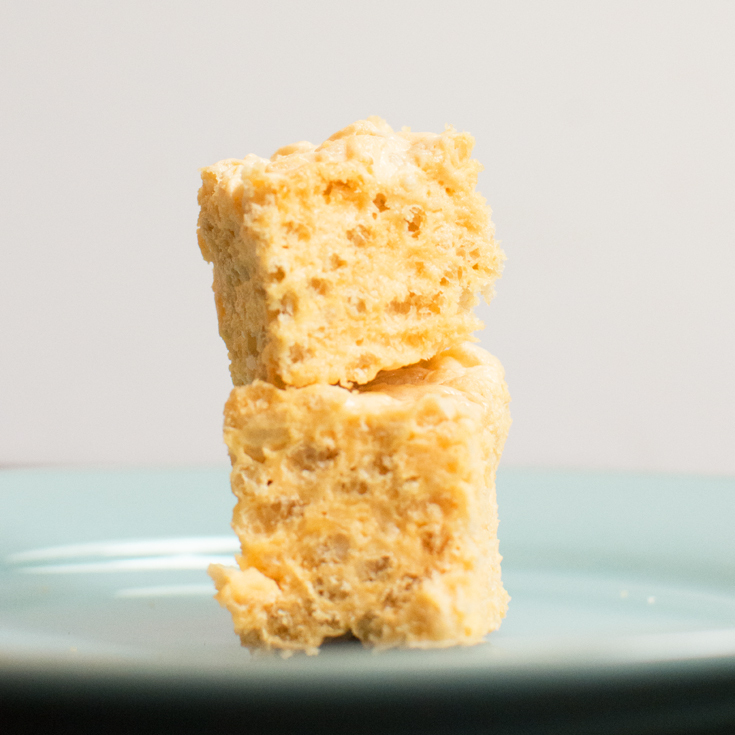 Just three ingredients, gluten free rice puffed rice cereal, vegan gluten free marshmallows and margarine. They were done in 15 minutes and cooled in an hour just in time for the parent meeting. Everyone loved them and the vegetarians and the gluten free folks were happy. Everyone learned that marshmallows have horse hooves in them, which is pretty gross really, and we all got to try something new! Plus my craving for rice crispy treats was taken care of. So it was a win, win, win and win! Even the husband liked them, win! If you need help finding some of the ingredients I have linked to them below for sale on Amazon. Some of the links below are affiliate links which means that, at no additional cost to you, I will earn a small commission if you chose to click on the link and go to purchase the items. Thanks! Lightly grease your pan, 8x8 works, but larger is ok if you like your Rice Krispy style treats on the more thin side. Melt the butter in a large pot when the margarine in a large pot when it has melted add the marshmallows. Stir until it combines. Then add the puffed rice cereal and stir to coat it with the marshmallow margarine mixture. Do not let it cool. Immediately spoon it into your container of choice. a 8x8 works well and flatten into one layer. Let cool 1 hour minimum then cut to serve. Super easy! The only thing is you must leave time for them to cool so that you can easily cut them and take them out of the pan. Yum the recipe to your collection or pin it with the Pinterest pin below. Thanks for sharing!